The Highlight effect lets you to turn a drawing's area lighter to simulate a light source. For this effect, you will need to create a matte to determine the shape and position of the highlight on another element and so you can blur the edges to create a softer effect. By adjusting the Highlight properties, you can control the type and amount of blur, as well as the colour of the highlight effect. Click the Add Layers button and select Effects > Highlight. 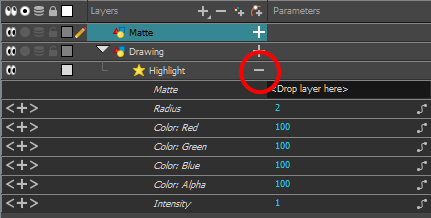 The Highlight effect is parented to the selected layer. In the Drawing or Camera view, create a drawing on a new layer that will act as the matte. In the Timeline view, click the Collapse/Expand button on the effect layer. 1. Drag and drop the matte layer beside the Matte field. Display the Highlight properties and adjust the properties to control the type and amount of blur and the colour of the highlight effect. Truck Factor Activated by default, this option readjusts the blur when the elements undergo a change of depth or scale. When disabled, the effect's values will remain unchanged regardless of depth or scale changes. It is recommended that this option be disabled when multiple drawings are composited and attached this effect. Directional: The matte is blurred in the direction you select. If you selected the Directional Blur type, you can set the direction of the blur by entering a value from 0 to 360 in this field. The distance where the blur fades from the edge of the image. Select a value between 0 and 1. Invert Matte Inverts the matte used to create the tone, shadow, or highlight. Use Matte/Source Colour Creates the shadow or tone using the matte shape's colour. Be sure that you are in render mode to see this effect and that your background is NOT white and that you do NOT have a white colour card node attached to the composite. As the matte only gives colour information, but no alpha, the matte is automatically multiplied with the background colours. If there is no colour card attached and the background appears black, you will see the matte colour at full opacity. If it is multiplied with a white background, the colours disappear into the full 255. Multiplicative Multiplies the tone or shadow colours with the background. 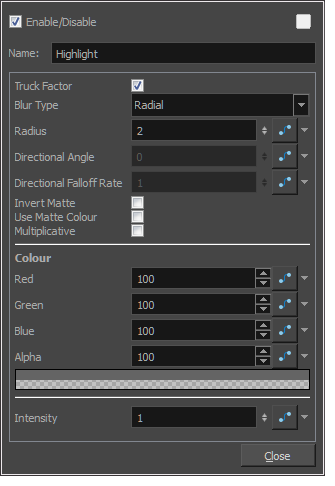 RGBA Enter a value to add or subtract from the colour channels in the drawings or attach these values to function curves. Colour Swatch Opens the Colour Picker where you can specify the colour. Lets you set a value to determine the strength of the effect or attach a function to animate the effect.